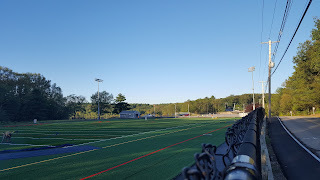 We are writing to provide an informative update on the status of the high school running track and turf fields at Pisini and Beaver Pond Fields, which have been undergoing renovations. We share your frustration and concern about the delay of the project and the impact on our student-athletes. 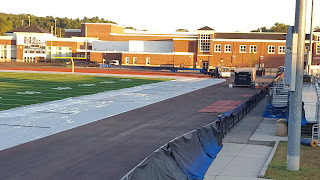 Although a new turf field has been installed, the field can not be used until the new track is complete. Although a significant amount of time has been spent by both school and town personnel planning appropriate timelines for renovation, there has been an unforeseen delay with the subcontractor who installs the track. The work began last week and is estimated to last approximately two weeks. They can not install in the rain, and each day of rain causes a further delay. The project’s completion date, at the moment, is estimated to be September 20th, depending on the weather. As such, we have been working to relocate the first two home football games of the season. The September 8th game versus Stoughton is scheduled for Randolph High School. The September 15th game versus Milford is scheduled to be played at Milford High School. We are also developing contingency plans should rain delay the project further, impacting the September 22nd football game. All field hockey games originally scheduled at Beaver Pond Field have been moved to the New Turf Field, which is located near the front parking lot on the high school campus. The boys and girls varsity soccer games that were originally scheduled for Pisini Field have either been rescheduled or moved to the New Turf Field as well. Many of the sub-varsity games originally scheduled on the New Turf Field have been rescheduled or moved to the new Upper Grass Field, which is located near the new baseball and softball fields on campus. We have been receiving daily updates from our municipal colleagues; they are applying pressure on the subcontractor through a daily fine for each day that the project is delayed and we are documenting the impact of additional transportation costs and lost athletic event revenue, which we anticipate recouping from the subcontractor. We know, however, that this does little to mitigate the impact on our athletic teams. We recognize that and express our sincere regret over the situation. We want to compliment the student-athletes and coaches for remaining positive, flexible, understanding and resourceful throughout these first few weeks of the new fall season. We will keep you informed should any new information become available.